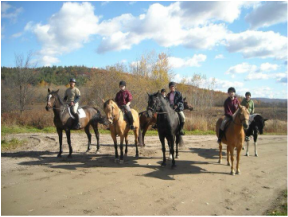 ​The Pontiac Equestrian Association was founded in 2010 with the primary goal of promoting and developing ecologically sustainable equestrian tourism and trail riding, by a group of enthusiastic riders who love beautiful trails, unspoiled vistas and good company. The Association is partnering with the National Capital Commission (NCC). The trail is now open from Steele Line Road, West, to the Vaillant Farm, on Lebrun Road, East and the goal is to continue it through to Luskville Falls. Spring 2018 - Thank you to the volunteers who work on the trail! The trail is being cut and cleared behind Vaillant's field, all along the mountain, to have easier access for people parking at the Vaillant Farm and eventually join up with the Luskville Falls trail. More work needs to be done there and elsewhere. Spring 2017 - A mudslide is blocking the trail about halfway between Pilon and Bradley. It is not yet stabilized, and it is dangerous to ride over it, as the clay is still soft and horses could get injured sinking in it an hitting broken branches under the surface. We now have a detour, it is safe to ride around it. Spring 2015 - Thanks to the NCC, the long-promised bridge linking the trail at Pilon Rd with the trails heading east to Luskville Falls is completed and ready to use! The trail has new culverts and has been entirely resurfaced. The next section to be built should extend the trail all the way to Luskville Falls. Every trail user must be a member in good standing of the Association and non-members must purchase a Daypass and show that they have liability insurance.